Happy Holidays. Just wanted to tell you that Carolyn's Facial Fitness (mostly organic and kosher) skin products are on sale and shipping is free until 12/13. My favorite pure Vitamin C Powder with serum. Why do I love this? Because you are the chemist here. 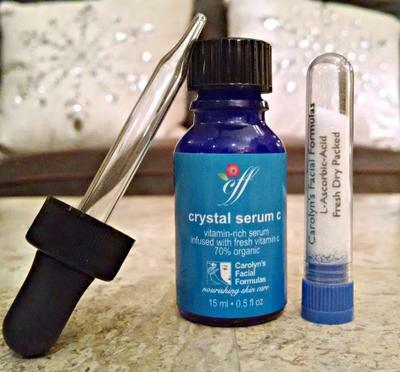 You mix the potent ascorbic acid (Vitamin C) powder into the vitamin rich <(and very soothing) serum when YOU are ready to use it. Unlike pre-mixed Vitamin C creams and serums. This one is NOT activated until you are ready to use it. I don't like processed foods and I don't like processed facial products - if I can avoid them, I do. I'll give that product a try. I'm always looking to try new products. But, still let's "face" the facts!!! There is NO cream in the world that will help lift and firm underlying skin muscles - which is ultimately responsible for lifting your face and bring back that youthful full firm face and high cheeks - like facial exercises. I'm not just saying this to promote this - I am living proof that it works. Take a look at my sad looking sagging neck picture taken a year ago this month. Look at the incredible change in a few months of doing simple facial exercises a few times a week. Sagging neck before and after pictures. I don't know how old you are, but after a certain age - like 50 or so - your facial muscles AND bones sag. And facial exercises can FIX that. Also, take a look at what happens over time to our facial skeleton bones. This picture shows what your facial bones look like in your 20s and then what it looks like in your 50s. When your facial bones atrophy, the skin has less to hang onto and as a result will sag NO matter what you're put on your face or how many face lifts surgeries you have! That's why (in my opinion) some face lift surgeries look strange or odd on some people. Especially when they are past 50 years old. You can lift muscles, but you can not maintain firm strong facial bones unless you challenge them with facial exercises. Plus, all of that extra massaging going on while doing the face exercises also helps firm and tighten the skin....A beautiful added bonus. My skin now feels soft and rubbery/bouncy. Where in the past it was starting to feel papery and thin. I would encourage all women and men who wish to look younger as they age to stimulate bone mass by doing facial exercises. The earlier you start the better and faster the results. Wow...! Great informative post, this is the most important part of my daily routine. After using annimateo, Total Renew & Reshape Anti-aging serum 3-4 drops on clean in my face and neck. You will feel instantly hydrated. If you wish, apply your regular face cream over. Really, it is most effective. Try once and see the result.